Almost simultaneously with the commissioning of the new church building in 1928 the organ was inaugurated. A Valkcx and Kouteren, built according to the then prevailing pneumatic cone drawer system, with eight votes and down pedal. The organ has been in service until 1993 but became especially after the expansion of the church building in 1982 (from 400 to approximately 620 seats) were too small. The limited capabilities and limited capacity occurred more and more funds. It is worth noting however that the organ the fate of many pneumatic organs, namely the scrap heap, was spared. Thanks to the efforts of Eastern Europe committee in Arnhem gave the organ a place in the Reformed. Church to Ilienie in Romania where it still serves every Sunday. The growth of the congregation made considerations to split the church, double shifts or expansion of the church is necessary. The churchgoers on Sundays simply no longer fit in the building. It was expanding. The realization took place in 1982. The now recommended created organ committee after extensive consideration to the construction of a new organ. That order was given to the brothers. Hoogendoorn Enschede: BAC Orgelmakers. The already built instruments of this organ builder (such as Candlestick Church Heemse) left a great impression on the committee. 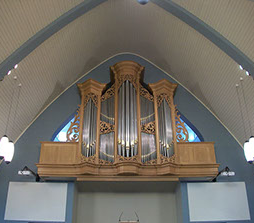 We opted for a real Dutch organ like that, particularly in the first half of the 19th century was built with clear recognition of the work of Bätz. The organ was given the primary task of guiding the congregation. In 1994 the new instrument was completed: 19 votes spread over two manuals and pedal, in a very well built with generous oak greenhouse carving. The labia of the front pipes were fitted with gold leaf. The location of the organ remained unchanged in the front of the church above the pulpit is still the most appropriate place for an organ! The organ builders were able to achieve in the (yet not too large) space under construction a parabola hoofdwerk- rugwerk. It would only promote the sound emission direction church hall. The church has a reasonable acoustics. However, this takes quite quickly when banks get filled. Nevertheless there is to sing well with a filled church. In man hours of construction and the intonation, the organ builder with this fact into account. In the construction of the plenum (full work) is that, even though soon. The instrument possesses a full, carrying sound of a mild nature. Both the main work as the uppers have a tremulant. The reeds have been very successful; the beautiful Dulciaan offers excellent party together with the sonorous trumpet 8'op the main work. Bassoon 16'van the pedal has funnel-shaped cups and put a solid foundation beneath the plenum but can also be used well beyond full employment. The purchase and arrangement of the reeds is paid much attention. The Cornet is a real "congregational vote" and associate strongly to the Bätzklank. A tingling Mixtuur crowns the whole. But the whistle can be heard many wonderful things. The combination 8/4/3 as yields on the upper, possibly with the Dulciaan hatching an alternative voice to the Cornet. All in all the whole is an organ with style and charisma. In recent years, were already several organ concerts by famous organists. Those entries in the guestbook witnessing great appreciation for the instrument. Marie Berg is happy! Moreover, it is an asset to the regional organ possession.